In October 1997 RAF fighter pilot Andy Green guided the Thrust SSC supersonic car past the speed of sound for the first time, smashing his own manned landspeed record. The Thrust SSC, powered by two Rolls-Royce Spey turbofan engines, averaged 763mph over two runs in the Black Rock Desert in Nevada and the record remains in tact almost 14 years on. While Apollo 11 made the giant leap for Mankind and Apollo 13 was immortalised in a Tom Hanks film, Apollo 10 actually made history as the fastest manned space vehicle during its journey back from a test run to the moon in May 1969. Apollo 10 entered the Guiness Book of World Records in 2002 for achieving speeds of 24,791mph on the way home. In February 2008, the Swiss climbing machine Ueli Steck climbed the 6,000ft north face of the Eiger mountain in 2 hours and 47 minutes at an average speed of 75 feet a minute, but his fellow countryman Dani Arnold followed that up in 2011 with a record time of 2 hours and 28 minutes. The 27-year old had no intention of breaking the world record on the tough north face of the Eiger shaving off 20 minutes from Steck's climb. Rocky Robinson doesn't just have the best name ever but he's also 'the fastest man in the world on two wheels'. Now a three time world record holder, Robinson posted his latest mark in September 2010, reaching a top speed of 394mph, averaging out at 376mph driving the Ack Attack speedliner. Concorde might have gotten business bigwigs over the Atlantic in under three hours, at 1,320mph, but the world record for a jet-powered vehicle is a whopping 7,000mph, that's Mach 9.6, almost ten times the speed of sound. The Boeing X-43A, an unmanned, experimental scramble jet, could fly from London to New York in 15 minutes. During a test drive for BBC's Top Gear in 2010, the Bugatti Veyron Super Sport became the fastest production car on the planet, clocking a time of 267.856mph, 14mph faster than the original Veyron's mark set in 2005. Thankfully, the speed will be limited to a mere 258mph for customer cars. 8. Who needs a jet powered motor? Canadian cyclist Sam Whittingham holds the world land-speed record for an unpaced bicycle, travelling on a flat surface at 82.3mph. He's the first and only cyclist to date to have broken the demi-mach barrier and travel at 1/10th the speed of sound. Check out his Varna Diablo III bicycle in the video below, it's not your average Raleigh. If, like us, you're fed up of spending you're entire sunday waiting for Arriva Trains to get you a couple of hundred miles across the country, then you're going to be even more sick after seeing what this Japanese Maglev train can do. Maglev means magnetically levitated, which means the train virtually floats on air, with magnets keeping it in in the vicinity of the track. Its top speed, posted in 2003 is 581kmph (361mph). 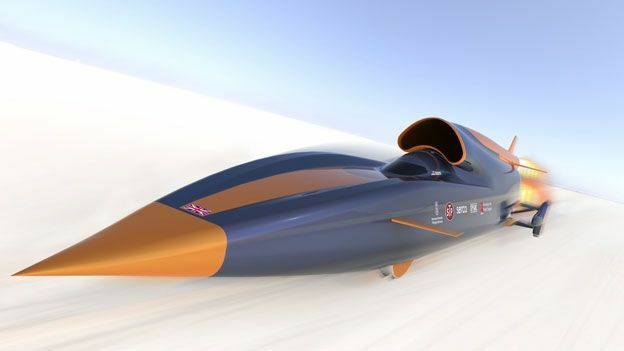 A group of British engineers is still aiming to smash the landspeed record set by the Thrust vehicle and cross the 1,000mph barrier with the Bloodhound SSC transonic rocket car currently being built in Bristol currently being tested in South Africa. The Bloodhound should be ready for a crack at the record hopefully some time later this year.